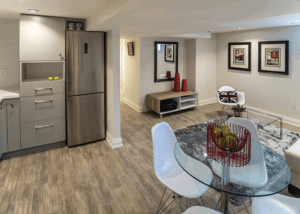 Thinking of remodeling your basement? Before you start you might want to think about getting it inspected first. Getting your basement inspected will save you money down the road from costly repairs that could occur later on. Once the issues in your basement have been resolved it is time to remodel. Before you start to dive in head first there are a few things you might want to consider adding to your basement. Insulating your basement might be the smartest thing you can install. Your basement is underground and stays pretty cool because of the wet dirt surrounding your foundation walls. Insulating will help to regulate the temperature in your basement as well as help with moisture. Installation of a waterproofing system with a sump pump will help to keep water from destroying electronics, furniture, flooring, and more. With the installation of a vapor barrier and a dehumidifier, you can keep moisture levels down and keep mold from growing. 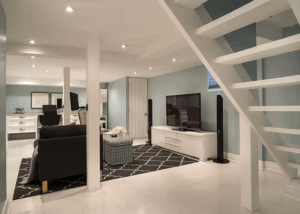 Soundproofing your basement should be on the top of your list. This will help keep noise from bothering family members on the main floor and even neighbors. You can ask a contractor to soundproof your basement for you or you can do it yourself. Some options to soundproof your basement would be installing carpet, curtains, acoustic panels, foam insulation, noise control drywall and framing to your ceiling and walls. 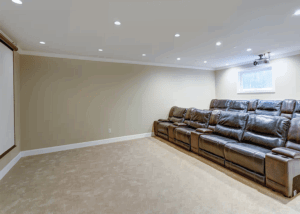 If you plan to use your basement for entertainment you might want to figure out your wiring and lighting. For a game room, you might want to hide excess wires from showing under the carpet or behind shelving. Basements are usually dark rooms with little or no natural light. Installing lights in the ceiling will help to create a more natural feeling and provide light for all your entertainment. 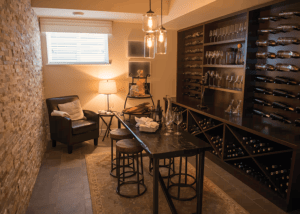 Below are 7 inspiration ideas to get you started on your dream basement. Great room for kids and adults to entertain. 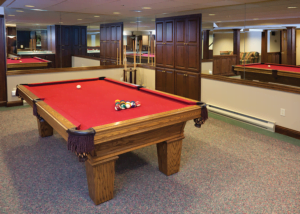 Having a game room in the basement is a great way to reduce noise in the home. If you plan on doing a console gaming room make sure you have a dedicated wireless network so you don’t run into speed or disconnect issues. Add shelving to hold your consoles, board games, and other gaming accessories. Tired of going to the gym? 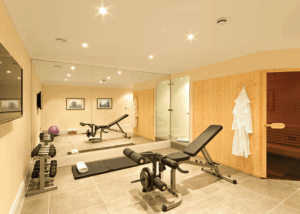 Creating a fitness room in your basement will save you time away from home and give you the privacy you want. Adding carpet tiles, rubber flooring, foam flooring, or vinyl flooring will help reduce noise and add some cushion to your workout room. Have a relative or friend living in your home? Give them a space of their own. Having their own space will give you and them their own privacy. Installing a kitchen, bathroom, bedroom and living room will create the perfect space for them and also give your home an increase in value. Want a second living space? You can create a nice hangout for watching movies or the big game in your second space. Add floor rugs if your basement flooring gets too cold to make it cozier for all. When creating this space think of installing a surround sound system since the noise won’t be bothering people from up above. Love going to the movie theater? You can have your own private movie theater right below your feet in your basement. Make sure when installing you account for the wiring needed for the surround sound and projector, you won’t want the ugly wiring showing. 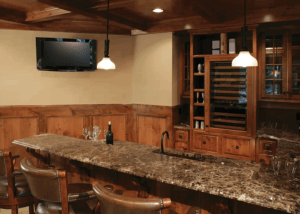 Building a bar is great for entertaining…why not put one in your basement? Adding a big screen tv and a bucket of wings and you can have the next big game party at your home.